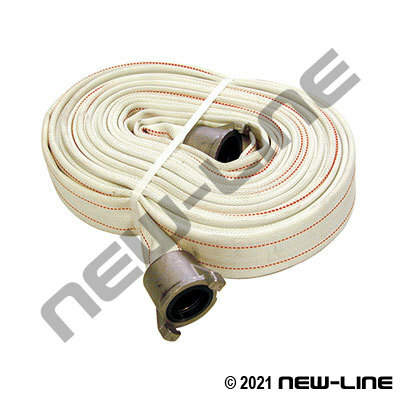 We also offer an entry price point, non-treated white hose (A9715) as a competitive option to lower end, one time use type standby forestry fire hoses that are on the market; it should be noted that this hose is not designed for construction, rental, plants, washdown, dragging, or longer term use - it does not have a protected reinforcement and will fail once the cover is frayed. Construction: Tube:Black Natural Rubber. Jacket: NL9715 Non-treated, non-coated white all synthetic circular weave. Notice: Not for washdown, standby forestry fire only - no warranty.